I'm against the status quo and the two state solution because I think all people Should have freedom of movement and civil rights. I'm against the one state solution because I enjoy being the overdog. Lots of Jewish privilege will disappear if israel ever admits millions of non Jewish citizens. And who doesn't like privilege? So here I am caught between selfishness and principle. I can't accept the status quo because of how it treats Arabs. I can't accept a two-state solution because of how Jews will be treated in the Arab state. And I can't accept the one state solution because I don't want Jews to lose the advantages they currently enjoy in Israel. Is there a fourth way? I'm going to use this video to attempt to say a few semi-intelligent things about the Middle East. See it after the jump. So let's do a review: Which Allen Edmonds shoe is best for shul? This is the shoe that was the Inauguration Day footwear choice for Presidents Reagan, H.W. Bush, Clinton and G.W. Bush, and also the Allen Edmonds shoe that two thirds of the people who answered my poll wear to shul. Its not hard to see why. They are sleek, classic, timeless and traditional. But they aren't my cup of tea. I don't like cap toes (probably because my father wore them seven days per week) and black is a little boring. The Fifth Avenue is another timeless, classic though slightly more modern than its Park Avenue sister. As with the Park Avenue, I recognize everything that makes this shoe outstanding, and wouldn't turn down a pair if they were offered to me for free by a greatful Allen Edmonds represenative, but they aren't what I wear to shul. 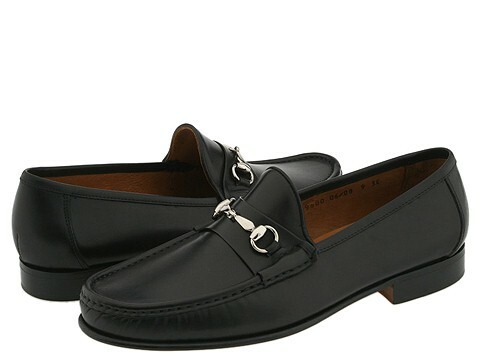 Style bloggers frown on both bicycle toes and black shoes that aren't cap toes being worn to funerals and weddings, but I say that Sagamore (or its felow bike toes the Dawson and Hillcrest) may be the perfect shul shoe for those of you who are 40 and over. They are boring, black, and just far enough out of fashion to please the typical middle-aged Orthodox Jewish man. Do not attempt to wear this shoe to shul unless you're (a) in your 20s (b) wearing a slim fit suit and (c) in better than average shape. But if you meet those critiria, and you don't daven with a bunch of judgemental prudes, I say go for it. I've seen people do it, and it looks great. Both are really nice cap-toes, only ick: cap toes. Really a stunning shoe, but I'm not partial to wingtips. 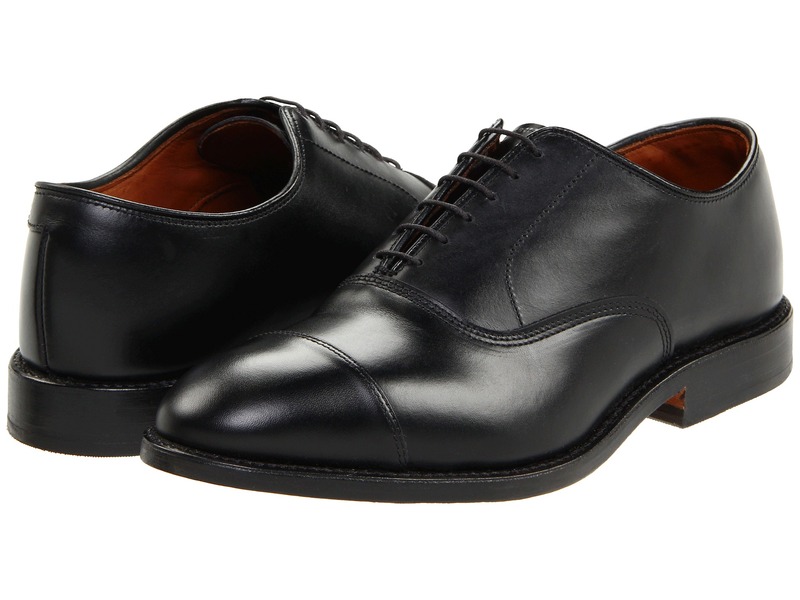 Also see everything I said above about the Strand, its cap-toe cousin. A really nice derby with a a cap toe and a medallian. The problem is that some will say a derby is too informal for shabbos. I don't happen to agree. Naftali Bennet's He-Men-Israelis never apologize advert rubs me all the wrong ways. Acknowledging sins is sign of strength and growth. Does Chanukah have a happy ending? Tonight the thought occurred to me that it does not. Within a generation the Maccabee successors were Hellenized complete with Greek names. John Hyrkanus was one. Alexander Yannai was another. They were corrupt, vicious, enemies of the Rabbis. Greek in every way. Very, quickly, they became the very sort of people the family founders had fought against. All Judah and his band of brothers managed to do was delay the inevitable. But the impact of Greek culture on normative Judaism Judaism, the influence the Mighty Macs tried to prevent, has not been all bad. Our wisdom books carry the stamp of Greek philosophy. The seder, and various legal and liturgical forms are based on Greek predecessors. We embraced a hellenistic hermeneutical method. Plato's theory of ideas gave us the concept that the soul posses perfect knowledge before birth, and Greek astronomers corrected our Torah-true cosmology. Much later, we absorbed Greek mathematics and Greek medicine. Maimonides and others dedicated Herculean efforts to reconciling Jewish thought with Aristotle's ideas. The very idea of a logical, legal code is based on Greek principles of codification. So the fact that Judah and his brothers ultimately lost, isn't quite the tragedy we might imagine it would be. Here's a little known fact: Cops were killed back when Saint Rudy the Magnificent was NYC mayor. And no one blamed him for this. I bring this up, because opportunistic Republican jackasses are lining up to blame DeBlassio and Obama for the behavior of the deranged man who shot two cops on Saturday afternoon. UPDATE: Some of our so-called public intellectuals appear to be guilty of the same sin! How can you possibly hold the mayor to blame for the unpredictable behavior of a crazy person? Moreover, if DeBlassio is personally responsible for the stabbing in Crown Heights and for the Saturday executions, doesn't it follow that Giuliani is personally responsible for the sexual torture of Abner Louima and the killings of Amadou Diallo and Patrick Dorismond? Of course, no one but an irresponsible blowhard would say that about Giuliani, but isn't that precisely what Gil, Pataki and Kerick are doing to DeBlassio? Bottom line: Blue lives or Jewish lives vs black lives is a false choice. When you suggest its one or the other you are making the problem worse! Worst sermon trope: Connecting Mikeitz to Chanuka. Guys, you can connect ANY Parsha to Chanuka. Promise. Earlier this week, authorities in Tehran unveiled a monument to slain Iranian Jewish soldiers who died during the country's long and bitter war with Iraq between 1980 and 1988. Death tolls for the hideous conflict differ, but casualty counts usually reach more than 1 million for both countries. A public ceremony marked the memorial's opening on Monday, with speeches that took place at a dais flanked by the Iranian flag and a menorah. Banners showed the images of fallen soldiers, hailed as "martyrs" in Farsi and Hebrew inscriptions. Now all we need is an Israeli memorial honoring Arab heroes, who fought and died in Israel's wars... oh. wait. Official Position: EVERYTHING THAT HAPPENS TO YOU IS MINUTELY AND DIRECTLY CONTROLLED BY GOD. Not even a leaf can fall without God's express permission. If something terrible befalls you, its because God wanted it that way. The Ohr Hachaim sees evidence he is right in the behavior of the Jacob's 12 sons over the last two parshas. In Vayeshev, Reuven acts to save Yosef from the wrath after his brother's say, "Then we'll see what happens to his dreams.” According to the Ohr Hachaim, Ruven offers the following argument: "If you want to see if his dreams are true, you can't kill him, because no matter what God intends for Joseph, we can over-ride that divinely-intended destiny by exercising our own free will. Instead, let's throw him in the pit. Its full of animals, and animals have no free will. If the animals eat him, we'll know his dreams were nonsense, but if he survives we'll know God has something great in mind for him." In Miketz, the brothers are imprisoned by Joseph for three days; afterwards, they are released and Joseph offers them a deal. Leave Shimon here as a my hostage, and the rest of you can go home. At that point, the brothers investigate their deeds and conclude that they are being punished for how they treated Joseph. Asks the Ohr Hachim, why are they performing this self-investigation now? Shouldn't they have looked into their deeds during the three days of imprisonment, when it was far from clear that they would ever be released? Why wait until now, when Joseph is delivering what appears to be good news and the ordeal, largely, appears to be over, to start searching for the cause of their misfortune? The answer: The brothers didn't think their imprisonment was a function of God's will. They thought they were the victim of a free agent acting through his own free will. Only when they were released, and Shimon was separated from them did they start to notice parallels between their current situation, and the way the treated Yosef. Once again, a brother was being taken away, and that brother was the very one who had initiated the plot against Josef. The review of their deeds wasn't prompted by misfortune, but by the eerie parallels. We'll meet again, Don't know where,don't know when, But I know we'll meet again, some sunny day. Keep smiling through, Just like you always do,T ill the blue skies drive the dark clouds, far away. Like you, I am sick unto death of the ultra nationalist idea that all liberals hate Israel, and that no real Zionist could possibly oppose Israeli expansion in the West Bank or child-killing in Gaza and the suspension of civil rights in the territories. I'm tired of being called "anti-Israel" when what I am, simply, is anti scary zealots like Naftali Bennett, and their contention that some nebulous idea of "security" justifies all. Anyway, I bring this up because the Times has a nice feature today on people the ultra-nationalists deny exist: Liberal Zionists. Meet Rabbi Daniel Zemel, a real ohavai tzion, who presides over a politically-powerful liberal congregation in Washington and feels nothing but anguish over the direction Israel has taken. It all started with what I thought was a simple, innocent joke. I saw that some small-time mayor had elected not to participate in his town's Chanukah lighting ceremony, so I tweeted the headline with a small joke attached. Someone finally said no to Chabad? Rt @hsabomilner: Mayor refuses to participate in Hanukkah ceremony http://t.co/dw2XzWflr6"
Now, I don't think this is the funniest joke ever written. Its barely Leno-worthy. But the wisecrack sort of works because it plays on the idea that Chabad is deeply associated with candle lighting ceremonies. That's part of their brand. Its what they do. So I made a little joke about it. Harmless, right? Well, not according to one gentleman who, in his profile, ironically identifies himself as a "funny Jew." He thinks my tweet qualified as a hate crime. @DovBear @hsabomilner Love the senastional headline you put up. Sorry you hate Chabad so much. Why do we say that Chanuka remembers an oil miracle? Why do we say that Chanuka remembers an oil miracle? The only miracle discussed in the Book of Macabees is the military victory, the same miracle we talk about in the Al HaNissim. The small jug of oil first appears in the Talmud, codified about 600 years after the events of Chanuka. In the interim, a variety of rabbinic stories were told to answer the questions: (1) Why do we light candles on Hanukah? (2) Why is Hanukah 8 days? One easy answer (and beware of easy answers) is that the Rabbis wanted to de-emphasize the majesty of the Hasmoneans after they (the Hasmoneans) either (1) joined forces with the Sadducees and/or (2) presided over a civil war (ca. 67-61 BC) during which perhaps more than 100,000 Jews were killed. Support for this answer appears on the same page of Talmud where the oil miracle is first mentioned. On Shabbat 21b the Rabbis tell you that "in times of danger" Chanuka candles can be lit on a table: in other words, don't be a martyr like Judah and his brothers. Risking your life for the sake of Chanuka is not needed. A second easy answer (same caveat) is that the Rabbis were wary of capricious rulers, and thought it wise to stay silent about that time in the past when we rose up and overthrew the ruling powers. Boy, do I wish there was a way to go back in time and face down all the sniveling, sputtering torture apologists who used to hang out here. As we now know, the CIA torture program produced no useful intelligence, and was managed in a haphazard, irresponsible way. It produced nothing but a stain on our values. All that happened is a group of lunatics worked themselves into a self-righteous frenzy, and convinced of the rightness of their cause and the nobleness of their character, they committed unspeakable abuses. This is precisely what I said would be discovered if the true story of the torture program was ever released, and now that the Senate has completed its investigation we know that I was right, and the feckless, Republican syncopaths who defended atrocities that were committed in our name were wrong. Jews only attacked military targets, and called in warnings first. Right? There are lots of myths surrounding the establishment of the state of Israel, and in the fullness of time I hope to address them all. Today, I'm going after the one that comes up whenever you point out that Jews engaged in terrorism back in the 30s and 40s when they were trying to beat back the Arabs and drive out the British. 43 Arabs were killed by a bomb at a marketplace in Haifa. 33 Arabs killed in multiple attacks, incl. 24 by bomb in Arab market in Suk Quarter of Haifa and 4 by bomb in Arab vegetable market in Jerusalem. 20 Arabs were killed by explosives mounted on a donkey at a marketplace in Haifa. 13 Arabs were killed in several shooting attacks around Jaffa during a one-hour period. Night of the Bridges Palmach units destroy 8 bridges linking Palestine to neighboring countries. Irgun operatives kill 6 Arabs and injure 42 by throwing grenades at a crowd of 100 Arab day-labourers who had gathered outside the main gate of the Haifa Oil Refinery looking for work. Arabs on the spot responded by killing 39 Jews. To the best of my knowledge, the only time an advance warning was called in was when the Irgun bombed the King David Hotel. Other attacked on military installations, such as the Lechi truck loaded with explosives that was driven into a British police station on January 12, 1947, were not preceded with warnings. Neo Chasidus is all about feeling good. From what I can gather, Neo-Chasidus is when an ordinary MO kid chooses to grow out his payis and spend an inordinate amount of time sitting in a circle singing Carlebach songs. It also has something to do with using instruments during davening on Rosh Chodesh and fabrenging whenever possible. Part of this is also pretending that your "spirituality" has been enhanced and that all the singing, and dancing and, you know, all that feeling, has brought you closer to God. It's hard for me to take any of this too seriously. For starters, I don't agree that the styles of Judaism they reject are flawed. The coolness and the dryness are features, not bugs. I prefer the Angelican High Church to the snake charmer's basement. Moreover, from where I sit this looks no different from, say, the Black Pride movement that got everyone wearing dashikis. For some people, there's something appealing about "authenticity" and because authenticity is a chimera, you approximate it by embracing various affectations. So George from Manhattan becomes Kwami and starts keeping Kwanza and tells himself this is precisely how his ancestors behaved. Sam from Teaneck, now Shmuel, is doing the same thing, as a result of the same forces, when he puts on a gartel and announces himself a Neo-Hassid. And never mind, that no one in George's family tree is from West Africa, or that Sam is a descendant of Misnagdim. Now of course, I think all of this is perfectly harmless, and of course anyone can choose to embrace any fad they wish. I only object when embracing the fad involves making false statements. Own a pet rock if you wish, but don't promise me that the thing can think and breathe. Likewise, grow out your payis and become a full-fledged hippie if that's what makes you feel good. Just spare me the nonsense about how the affectations you've embraced are so much more than an exercise in feeling good. Judaism, please recall, is about torah, tzedaka and avoda. If acting like some 21st century approximation of a Polish farm boy makes you learn more Torah and do more good in the world, that's excellent. But if, it doesn't (and in most cases it doesn't) let's just be upfront about that, ok? 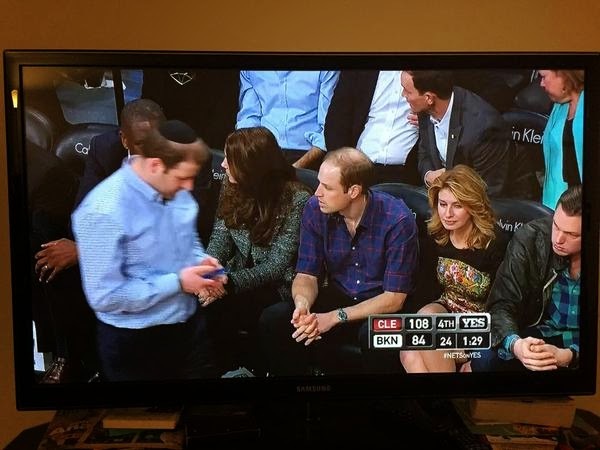 Yikes, but they sure did let that Yid get awfully close to his and her Highness at the Nets game last night. "התפללתי שבזכות מצוות השמיטה הממשלה תיפול"
מר שר התורה הגר"ח קנייבסקי התבטא בצורה חריגה בשיחה עם בני ביתו ואמר כי "התפללתי הרבה שתהיה לממשלה מפלה, שמעתי שגם ר' אהרן לייב התפלל. התפללתי שהלפיד של השמיטה יגבור עליהם". Rabbi Chaim Kanievsky, the great Torah leader, said, "I prayed a lot for the government to fail. I heard that Rabbi Aharon Leib prayed. I prayed for the Shmita observances to overcome them." To be perfectly, fair, I believe he prayed and I believe he thinks his prayers worked. The Israeli military announced Saturday that it had ordered criminal investigations of its own actions in eight additional incidents in the Gaza Strip during the war this summer, and provided unusually detailed justifications for seven other operations that had prompted complaints from human rights groups. This doesn't mean that Israel is as perfect as those God-drunk hasbarah bloggers claim. It simply means that Israel's angriest opponents are wrong, too. 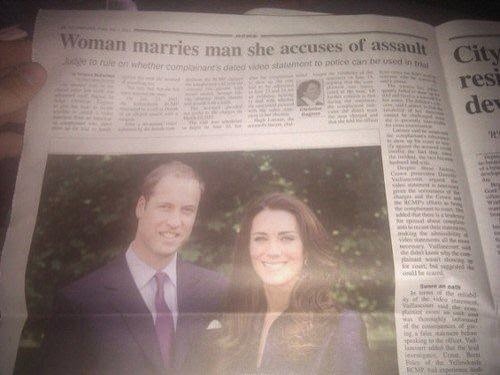 Great photo placement decision here! I'm sure haredi neighborhoods will be celebrating Lapid's downfall well into the night, but what I want to know is this: which Haredi triumphalist will be first to take credit for his demise? How long before some rabbi announces it was his own personal prayers that finally provoked God to take action against the anti-Haredi leader? I also would like to know what this means for fundraising. For over a year we hard working Americans have been urged to "send money now" to the poor, suffering avrechim who stood to lose everything because of Lapid. Well, now there is no Lapid. The poor, suffering avrechim should be ok now, right? Or at least that's what people will think, meaning the haredi al sharptons who line their pockets with the proceeds of every crises will need to dream up a fresh pitch. I apologize for not doing my part to trounce pruzansky for his latest indiscretion. As you probably know by now, he recently published an article that even he (eventually) found embarrassing and had to delete but not before the Arab Hasbaraniks on social media were using it to prove that all Jews everywhere are racist and murderous at heart. Only Jews like that Pruzansky are racist and murderous in their hearts, I told them. For whatever good that did. In brief, Pruz reacted to the horrible events in Har Nof by calling on Israel to expel all the Arabs. You can review the smoking snippet here. Certainly Pruz was writing from the perspective of the pain all of us felt viewing those horrible photos of blood drenched talitot, but that's no excuse. Not all of us who felt that pain allowed ourselves to devolve into barbarism. Those of us with character, and respect for human life did not react to the horror by advocating for Jews to commit a new horror of our own. Pruzansky isn't a terrorist. He'd never pick up a weapon and actually follow through with any of his insane prescriptions. The same can be said for the overwhelming majority of Arabs. We Jews like to pretend that we'd be murdered in an instant were we to enter an Arab town but it isn't true. Most Arabs, like most Jews, aren't murderous at heart. Like most Jews, most Arabs simply want to coexist, make a few dollars, raise their kids and stay out of trouble. If this sounds like a wishful, liberal fantasy you can thank the Arab murderers and loudmouths. Though they make up perhaps 1 percent of the Arab population they are loud and vicious enough to make it seem like all Arabs are drooling madmen. Pruzansky is loud and vicious, but not violent. I'd never equate words with actions. You can't kill someone with an insult. Pruzansky is just a preacher with an intemperate streak and that's no crime. But the damage his tirade did to our national reputation is real. Just as I want every Arab to know pruzansky does not speak for me, there are multitudes of Arabs who desperately want us to accept that the terrorists do not act for them. So do I have any Thanksgiving traditions? That's what "Jane" a reader from Teaneck wants to know. "You religiously provide us with rundowns for yom Kippur and pesach", she writes, "so what about Thanksgiving?" The true answer is it varies, which makes me accidentally in compliance with Rav Moshe who ruled that keeping Thanksgiving was OK for a religious Jew as long as you didn't make it into a binding annual obligation. My wife points out that preparing a typical American Thanksgiving feast is about as difficult as making a shabbos dinner. She can't understand why people need reams of instruction and several days of advance preparation in order to put one main dish and a couple of sides on the table. "I could do it in three hours she says"
I get into a fight with some yokel who thinks Thanksgiving has a religious component and is therefore off limits for Jews. Though next year I think we'll try frog eye salad, a concoction of pasta and cool whip that the New York Times says is a staple of the Mormon Thanksgiving. A brief, and biased history of riots. St. Louis Jews: please lay low for a few days. This won't end well. This advisory was released before the DA finished speaking (pessimism)(and maybe some racism). Notice it is directed at St. Louis Jews only (parochrialism), who live nowhere near Furgeson and, assumedly, are adults capable of looking after themselves (paternalism). Results of a new poll have been released in Israel that totally demolish some of the most dearly beloved myths of both the pro and anti-Israel camps. In short, activists on both side are dead wrong about important points. A poll published by Israel’s Channel 10 shows that the majority of Israeli Arabs oppose the use of terrorism against Israeli citizens. A massive 68 percent of Israeli Arabs who were polled answered that they oppose the recent wave of terror. The majority of the Arabs surveyed – 84% – stated that their representatives in the Knesset should condemn the terror attacks. Israel sovereignty was preferred by a vast 77 percent of the respondents, whereas only 23 percent desired to live under Palestinian rule. A recent survey conducted by Tel Aviv University (TAU) reveals a most astonishing fact – close to 50 percent of Israel’s Arabs support the right of Jews to worship at the Temple Mount. Esav served his father roast dog? For the "suggestion box": more Parasha, more Midrash. This leftist-rightist showdown is getting repetitive. Um, Roast Dog? Who can elaborate? Nov 20, 2009 - Pasha Notes: Toldos 2009. by DovBear at 9:00 AM. What everyone should know. Our midrashim lament Jacob's theft of the brochot, and ..
Nov 28, 2007 - Elsewhere, my friend Chaim is attempting to tell us that Esav was the epitomy of evil, and he's using midrashic matrial to defend his point. Nov 13, 2007 - Analysis of Ya'akov's deal with Esav (lentils for birthright) has to include consideration of Esav's physical state at the time of the deal. Nov 26, 2006 - Gen 25:28 reads: "And Issac loved Esav because of the game in his mouth." (tzayid b'fiv) This is a hebrew idiom, which suggests Esav as either a kind of lion bringing home food in his mouth, or as a mother bird dropping worms into her chick's gapping beak. In either case, it's a material and, therefore, . DOVBEAR: Why was Isaac blind? Nov 15, 2007 - The answer to this question is a wonderful illustration of Rashi's way with midrashim, and also an indictment of how our children are taught in the typical Yeshiva. ... Explaining this midrash is beyond the scope of this post (also, ...We're told Issac was blind immediately before the blessing story begins. Why? Nov 1, 2013 - Five reasons are given for Isaac's blindness. Perhaps the best known one is cited by Rashi on Gen 27:1 "Another explanation: When Isaac was ..